Last night the Toyota Grand Prix of Long Beach kicked off their annual Tuner Thursday activities. Formula DRIFT took part and had some cars on display and drivers giving out autographs to the lucky fans. Don’t forget this weekend is the Team Drift exhibition during the Grand Prix. 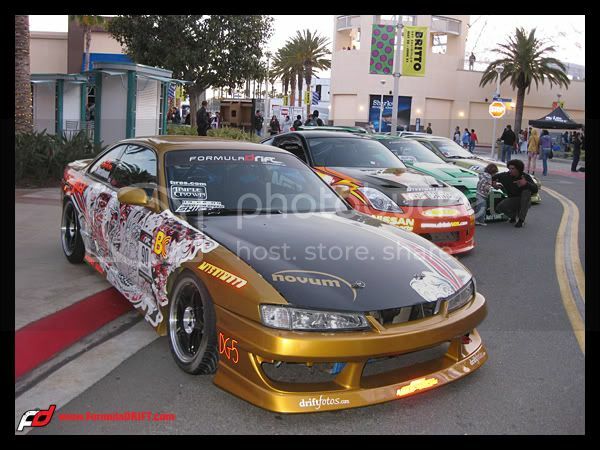 For more info check out the Team Drift Page. Here is some video of Formula DRIFT drivers Samuel Hubinette and Tanner Foust explaining what Team Drift is all about. Team Drift begins Friday and ends on Sunday during the Toyota Grand Prix of Long Beach. Smith column: It’s a rough life for a tire on a Formula Drift series car, like at this week’s Toyota Grand Prix of Long Beach. LONG BEACH — You’ve been tire-d.
Just imagine having one of the worst, most thankless and inglorious jobs in all of sports: Being a tire on a car that’s running Formula Drift series, which slid through the streets of downtown Long Beach last Saturday and will have another exhibition Saturday as part of the Toyota Grand Prix of Long Beach weekend. You’d be, say, a tire used by Formula Drift pro Rhys “Mad Skills” Millen, 35, of San Juan Capistrano, who drives the No. 6 RMR Red Bull Hyundai Genesis coupe. A month ago, you had arrived at his Huntington Beach race shop on a pallet of two dozen tires shipped by Cypress-based Toyo Tires. Your name: Toyo Proxes R1R, an extreme performance tire designed for serious street driving. And by serious, we mean accelerating at high “Fast and Furious” speeds, sliding sideways through corners as tight as the bends in a paperclip, fishtailing out of curves and generally being used and abused, scorched and torched in a driver’s heavyweight bout with the asphalt. That is, as opposed to having the car flip over and tumble into a retaining wall line with stacks of junkyard-bound tires. 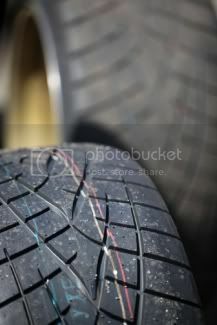 Your tread’s ornate pattern runs deep – eight 32nds of an inch – and you’re as tacky to the touch as a lint roller. Once at the track, you start to adhere to gravel, gum, pennies, cigarette butts and loose screws and bolts and pebbles that lodge themselves in your tread like corn in teeth when eaten off the cob. You get inflated with nitrogen to a pressure ranging from 22 to 38 pounds per square inch. Your temperature is that of the street and the sky, which last weekend was about 75 degrees. Then you go racing. The engine roars with horsepower and you spin, screech and scream as Millen hits the throttle at the flag wave of “Go.” In turns you spin even faster, hitting bends in the course close to 65 mph. Your rubber burns off. White smoke engulfs the car and the pungent odor of everything your made of – natural rubber, carbon black, sulfur, petroleum and the handcrafter’s sweat – tinges the sea air. Four turbulent turns inside an abrasive Long Beach quarter mile wear you down, killing you by the second. You’ve lost tread. Flecks of melted rubber have left skidmarks on the track, sprayed the fender walls black and flown inside the cars shocks, fuel cell and air filter. Then you stop. Crew members probe you with thermometers and check your pressure to see how you’re holding up. Your temperature after one lap on the drifting course has risen to 203 degrees down the middle, 175 degrees in the shoulder. Your pressure has elevated by five pounds per square inch. Your hot, bloated, exhausted, smelly and coated in track debris. You’ve gone through the most painful microdermabrasion ever. You don’t feel very attractive anymore. You’ll go out for four more runs during a race event. By the fourth time around, you’re spent, approaching baldness and loosing your grip on reality. So you come off the car. Rejected. Used. Dismounted. After enduring maybe two treacherous miles. You had given your life so that Millen could post practice runs several seconds quicker and six to seven miles of average speed faster than his competition. You would have been the first one blamed if Millen struggled. You won’t go up in a racer’s trophy case. You won’t get hung on a wall above a fireplace. You’d get shipped off to the tire disposal/recycling center on another pallet, an unsung hero taken out to the curb.